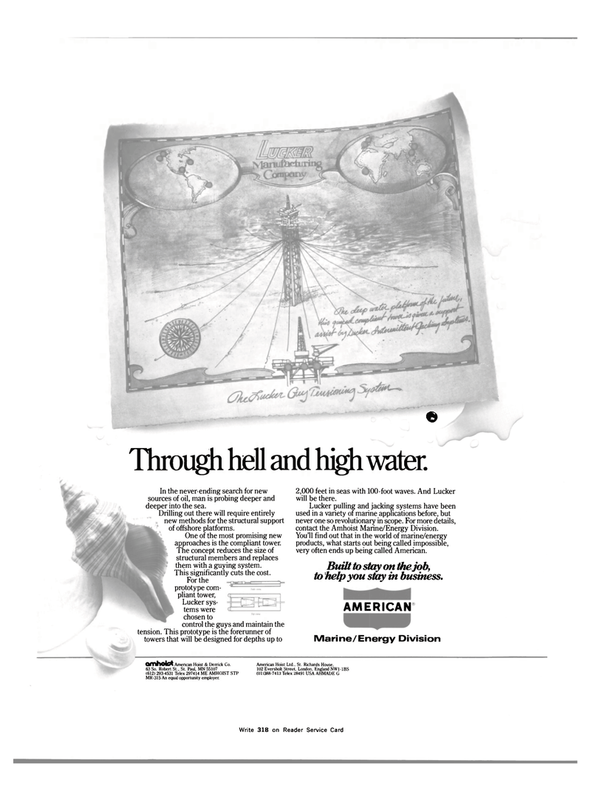 Through hell and high water. In the never-ending search for new sources of oil, man is probing deeper and deeper into the sea. Drilling out there will require entirely new methods for the structural support of offshore platforms. One of the most promising new approaches is the compliant tower. The concept reduces the size of structural members and replaces them with a guying system. This significantly cuts the cost. Lucker sys- tems were chosen to control the guys and maintain the tension. This prototype is the forerunner of towers that will be designed for depths up to 2,000 feet in seas with 100-foot waves. And Lucker will be there. Lucker pulling and jacking systems have been used in a variety of marine applications before, but never one so revolutionary in scope. For more details, contact the Amhoist Marine/Energy Division. You'll find out that in the world of marine/energy products, what starts out being called impossible, very often ends up being called American. Built to stay on the job, to help you stay in business. MR-315 An equal opportunity employer.